Barcode ribbon building program facilitates system user to modify color, font, position, height, caption, shape, dimension, size etc of designed wonderful retails barcode labels. Inventory control barcode generator software makes multiple copies of classic inventory barcode stickers with various text, color and barcode value. Barcode image maker application immediately builds high resolution retails barcode logos as per selective business needs. Professional inventory control barcode generator software offers triangle, picture, text, ellipse, rectangle, line, circle, pencil, barcode and many more designing objects to produce rich quality and precious inventory barcode stickers in real time. Advanced barcode ribbon building utility is successfully used by various profitable and non profitable application areas like manufacturing organizations, transportations, government agencies, postal services, shipping, banking sectors, airlines, retails, real estate, pharmaceutical industries, telecom sectors, healthcare etc. 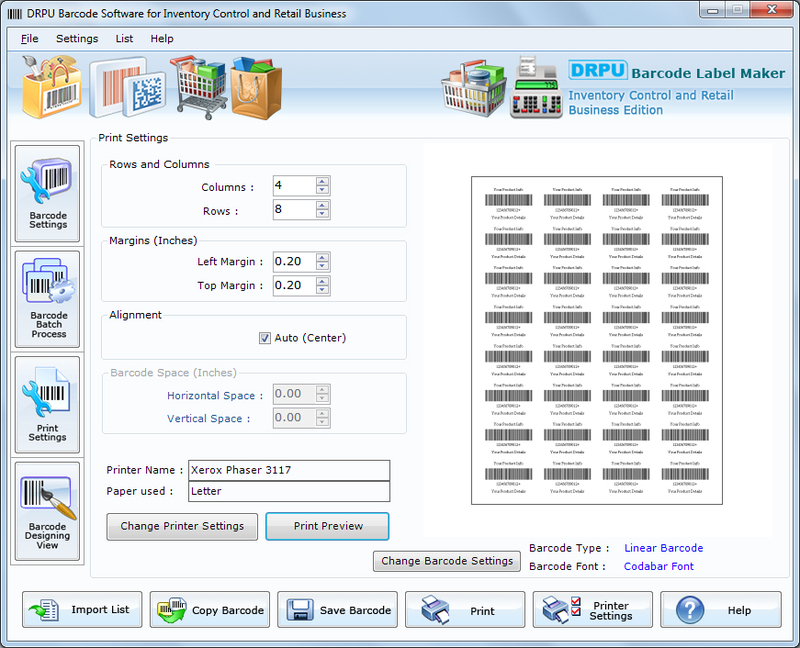 Qweas is providing links to Inventory Control and Retail Business Barcode Label Maker 7.3.0.1 as a courtesy, and makes no representations regarding Inventory Control and Retail Business Barcode Label Maker or any other applications or any information related thereto. Any questions, complaints or claims regarding this application Inventory Control and Retail Business Barcode Label Maker 7.3.0.1 must be directed to the appropriate software vendor. You may click the publisher link of Inventory Control and Retail Business Barcode Label Maker on the top of this page to get more details about the vendor.